Master the Powerful Python 3 Standard Library through Real Code Examples "The genius of Doug's approach is that with 15 minutes per week, any motivated programmer can learn the Python Standard Library. Doug's guided tour will help you flip the switch to fully power-up Python's batteries." -Raymond Hettinger, Distinguished Python Core Developer The Python 3 Standard Library contains hundreds of modules for interacting with the operating system, interpreter, and Internet-all extensively tested and ready to jump-start application development. Now, Python expert Doug Hellmann introduces every major area of the Python 3.x library through concise source code and output examples. Hellmann's examples fully demonstrate each feature and are designed for easy learning and reuse. You'll find practical code for working with text, data structures, algorithms, dates/times, math, the file system, persistence, data exchange, compression, archiving, crypto, processes/threads, networking, Internet capabilities, email, developer and language tools, the runtime, packages, and more. Each section fully covers one module, with links to additional resources, making this book an ideal tutorial and reference. 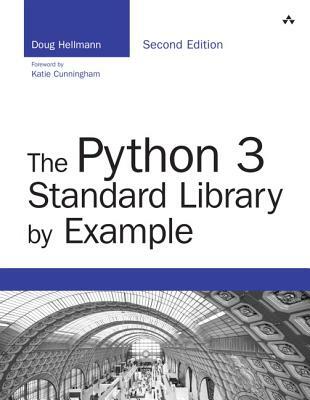 The Python 3 Standard Library by Example introduces Python 3.x's new libraries, significant functionality changes, and new layout and naming conventions. Hellmann also provides expert porting guidance for moving code from 2.x Python standard library modules to their Python 3.x equivalents. Normal 0 false false false EN-US X-NONE X-NONE. Doug Hellmann is currently employed by Red Hat to work on OpenStack. He is on the OpenStack Technical Committee and contributes to many aspects of the project. He has been programming in Python since version 1.4, and has worked on a variety of UNIX and non-UNIX platforms for projects in fields such as mapping, medical news publishing, banking, and data center automation. Doug is a Fellow of the Python Software Foundation and served as its Communications Director from 2010-2012. After a year as a regular columnist for Python Magazine, he served as Editor-in-Chief from 2008-2009. Between 2007 and 2011, Doug published the popular "Python Module of the Week" series on his blog, and an earlier version of this book (for Python 2), The Python Standard Library By Example (Addison-Wesley, 2011). He lives in Athens, Georgia.